Great news! We've taken the ideas from this blog post and turned them into our app Decipher Activity Transfer, featured on iDownloadBlog.com! Click here to see more and download Decipher Activity Transfer. 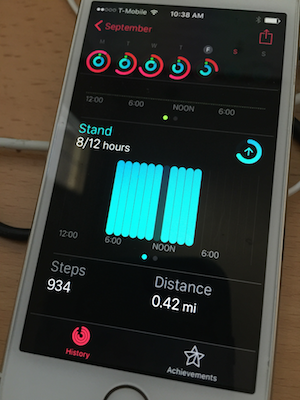 As the iPhone 6S and 6S Plus are nearing shipment, I've seen a handful of tweets from people wishing there was a way to keep their Health and Activity data (like achievements!) but start fresh on their new device without restoring from a backup of the previous iPhone. I have an alpha version of a tool that will make a "clone" of an iPhone, iPad, or iPod Touch backup, but the clone only contains the Health and Activity data. Then you can restore that clone backup to migrate only that data to your new iPhone! If you're interested in using this tool, send us an email through our support page and I'll send you a version. Make sure to tell us whether you're on Windows or Mac in the form so I know what to send you! You can read the article about Decipher Activity Transfer on iDownloadBlog.com, or click here to see more and download Decipher Activity Transfer. 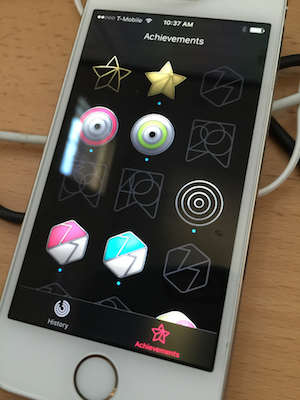 Yesterday, I did a little test run with this tool, simulating transitioning health/activity to a new iPhone. I currently use an iPhone 6 Plus with my Apple Watch, so I took a backup of my 6 Plus, and ran my tool to pare down the backup just to the health data. 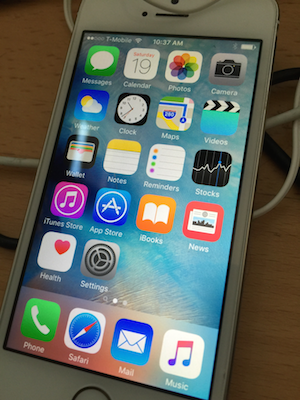 I restored the partial clone backup to my iPhone 5s test device. 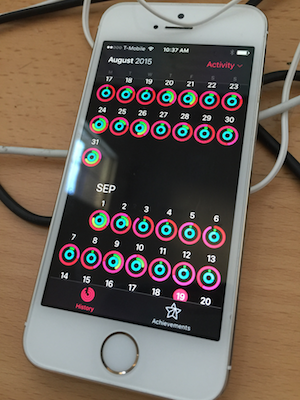 In order to see the Activity app data (and to appropriately simulate transitioning to a new iPhone), I also wiped and paired my Apple Watch to the 5s. The restore was a success, and I have a fresh iOS9 install on my iPhone 5s restored only with my health and activity! You can see my (not impressive) activity history and achievements stretching back in time. It's there all the way back to April, yay! The one thing I'm not happy with is that the activity data from yesterday is a little messed up. This is due not to the restore of the activity data, but the transition to a "new" watch, because I had to wipe and setup my Apple Watch as new. If you look closely at that photo, it says I have eight stand hours yesterday, but there are ten lit up hour bars. I wiped and transitioned my watch a little after 3pm yesterday (and then put it back on my real 6 Plus in the early evening). My educated guess is that the Activity app has a little bit of problems merging data from "two different watches" in the same day. It did take the better data of the two choices, which was the earlier part of the day from the "old watch." Not care, because one weird day is better than losing all days. Do the transition in the evening, after you're happy with your goals for the day. Or, do it in the morning before you've done anything. We could add in the watch settings/data into the stripped-down backup, so that when you pair the watch to the new iPhone, it prompts you to restore from your previous backup of the watch1. When I put my watch back onto my 6 Plus, it restored from the backup just fine and built upon my prior data from the day without flaw. This perfects that one day's activity, but is antithetical to the idea of starting afresh. I would love to take this tool and add a bunch of check boxes for the various pieces of data that it detects in the backup, then craft a custom restore file that only includes the selected options. Hi, thanks for tool works great. One great addition would be to also save SMS history+attachments (could be optional). Health needs to be stored encrypted so i can't merge the SMS history onto the Decipher Cleaned backup. So as it is, on a new install i need to choose between message history or Health history. I forgot to mention that it's also super-fun to restore a backup in iTunes that takes about 5 seconds to restore.